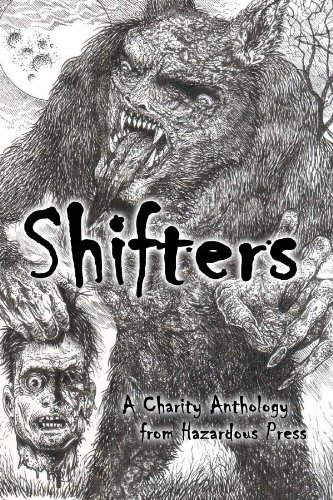 Hazardous Press has released a new anthology, Shifters: A Charity Shapeshifter Anthology, that sports a cover by Glenn Chadbourne. Reimagined fairy tales, western skinwalker legends come to life, scorching erotica, And of course, werewolves! 39 stories by David Wellington, Jay Wilburn, Aaron Gudmunson, Dane Hatchell, D. Alexander Ward, Mandy DeGeit, Doug Murano, Kris Freestone, Adam Millard, Brent Nichols, Cameron Suey, Tara Fox Hall, Christian A. Larsen, Rose Blackthorn, Terry Alexander, Steve Voelker, Max Booth III, Matthew Wilson, Beryl Knight, Lisamarie Lamb, Chantal Boudreau, Dana Wright, Lori Michelle, Rie Sheridan Rose, Dawn Napier, Jen White, Cameron Johnston, E.L. Kemper, Amanda Pillar, Jonah Buck, Emma Whitehall, Christine Morgan, Susannah Carlson, Robin Deffendall, Tracie McBride, and Erzabet Bishop. Cover art by Glenn Chadbourne, back cover art by Diana Whiley, interior illustrations by Kris Freestone and Leia Napier. All of our proceeds from this anthology will benefit the American Humane Association’s Red Star Rescue Team, which provides disaster response services for pets and domestic animals. We here at Hazardous Press would like to thank all of the writers who were gracious enough to donate their stories to this collection. We were truly overwhelmed by the number of authors and artists who wanted to participate. You can order Shifters from Amazon US. It’s also available for Kindle.